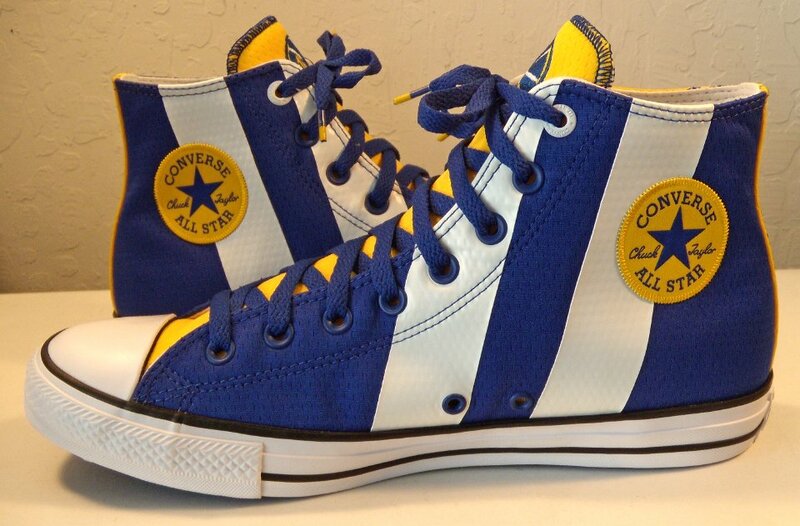 Photo gallery of Golden State Warriors tribute high top chucks. 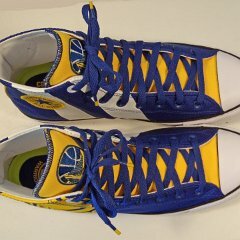 1 Golden State Warriors High Top Chucks Inside patch view of a right Golden State Warriors high top. 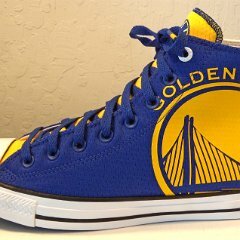 2 Golden State Warriors High Top Chucks Outside view of a right Golden State Warriors high top. 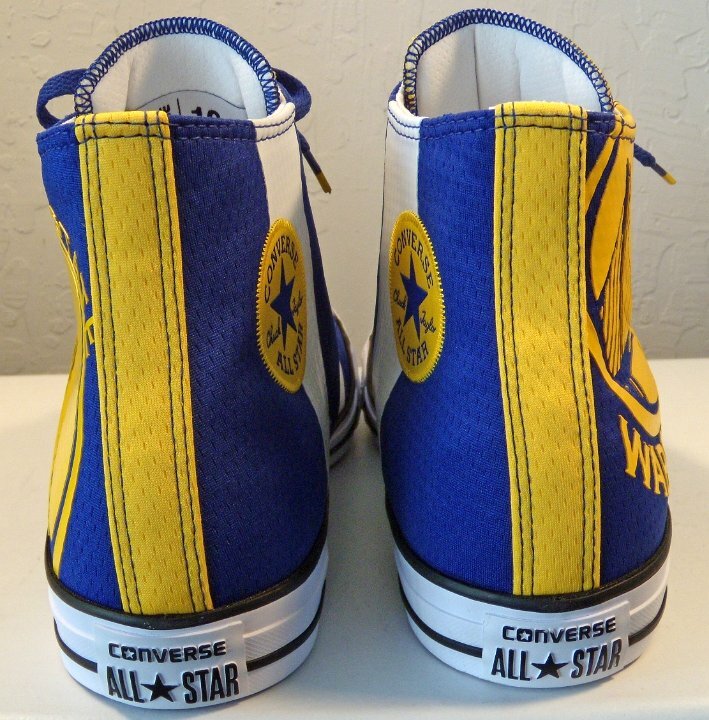 3 Golden State Warriors High Top Chucks Inside patch view of a left Golden State Warriors high top. 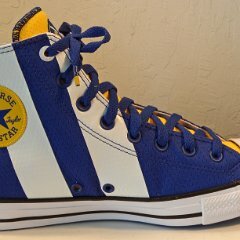 4 Golden State Warriors High Top Chucks Outside view of a left Golden State Warriors high top. 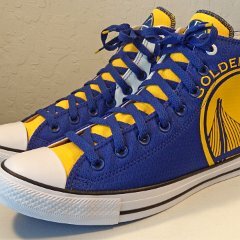 5 Golden State Warriors High Top Chucks Rear view of Golden State Warriors high tops. 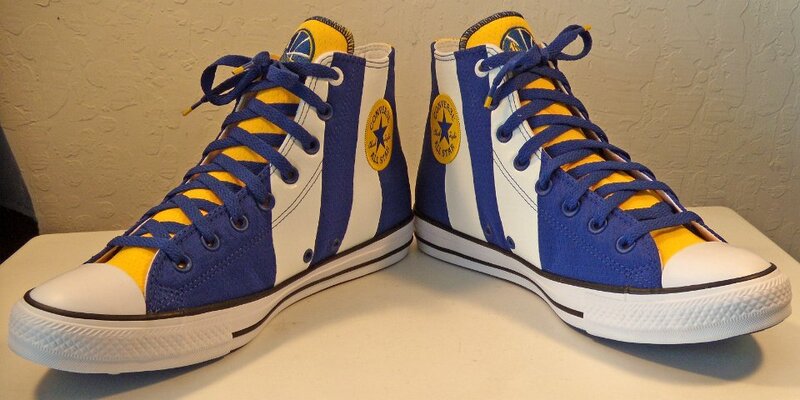 6 Golden State Warriors High Top Chucks Angled rear view of Golden State Warriors high tops. 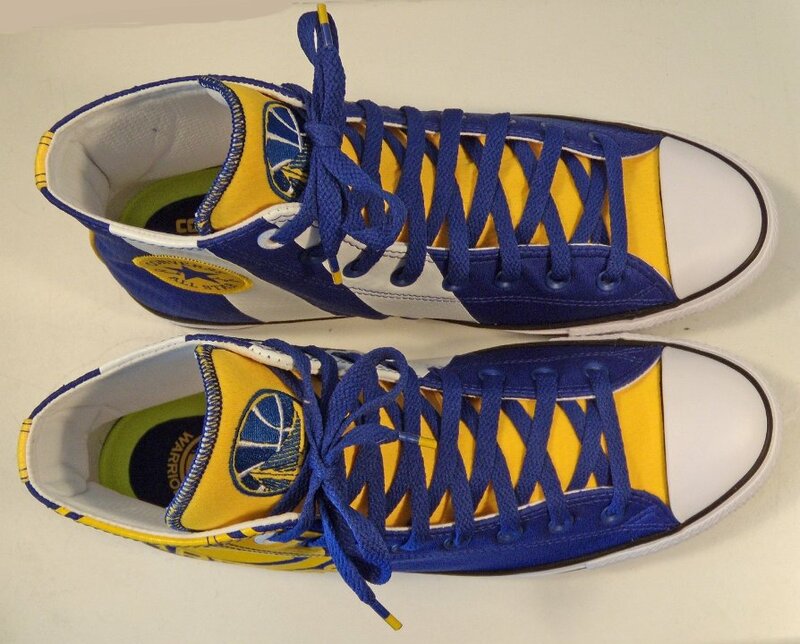 7 Golden State Warriors High Top Chucks Angled side view of Golden State Warriors high tops. 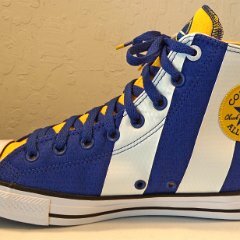 8 Golden State Warriors High Top Chucks Front view of Golden State Warriors high tops. 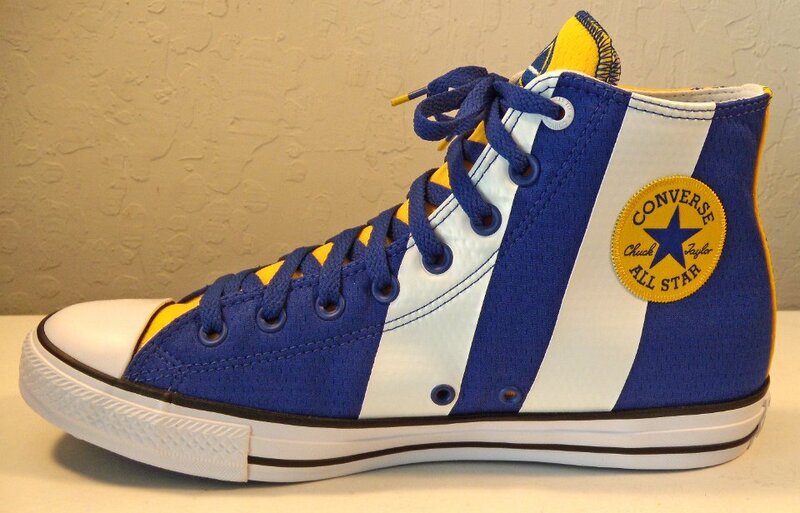 9 Golden State Warriors High Top Chucks Angled front view of Golden State Warriors high tops. 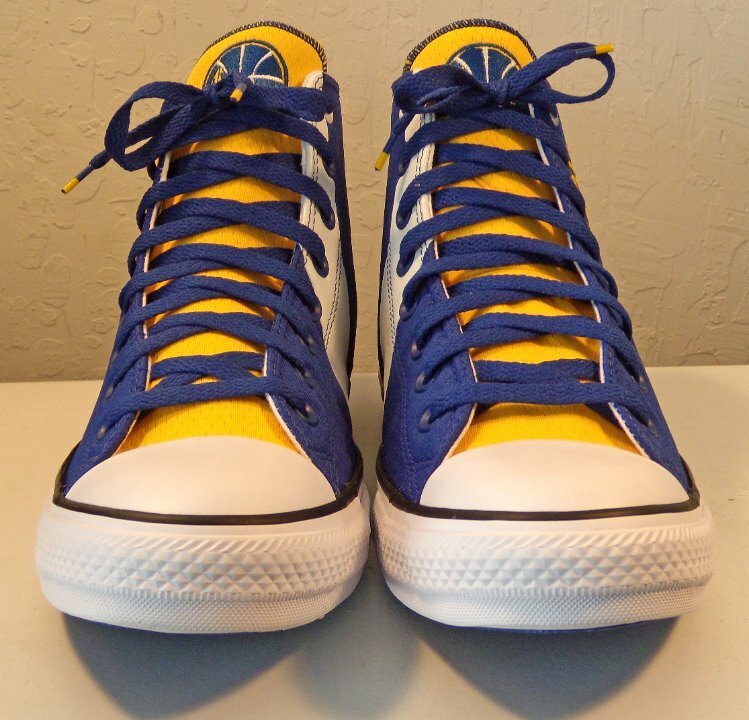 10 Golden State Warriors High Top Chucks Top view of Golden State Warriors high tops. 11 Golden State Warriors High Top Chucks Inside patch views of Golden State Warriors high tops. 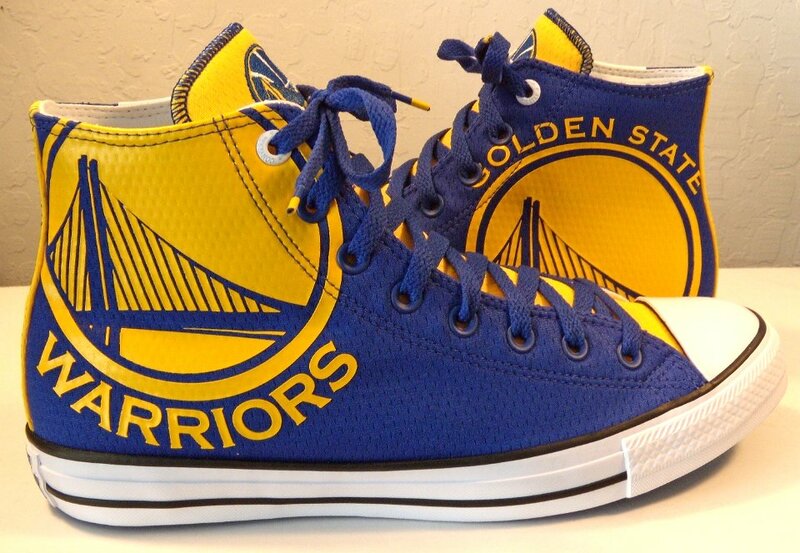 12 Golden State Warriors High Top Chucks Outside views of Golden State Warriors high tops. 13 Golden State Warriors High Top Chucks Outer sole views. 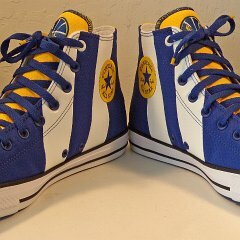 14 Golden State Warriors High Top Chucks Insole closeup view. 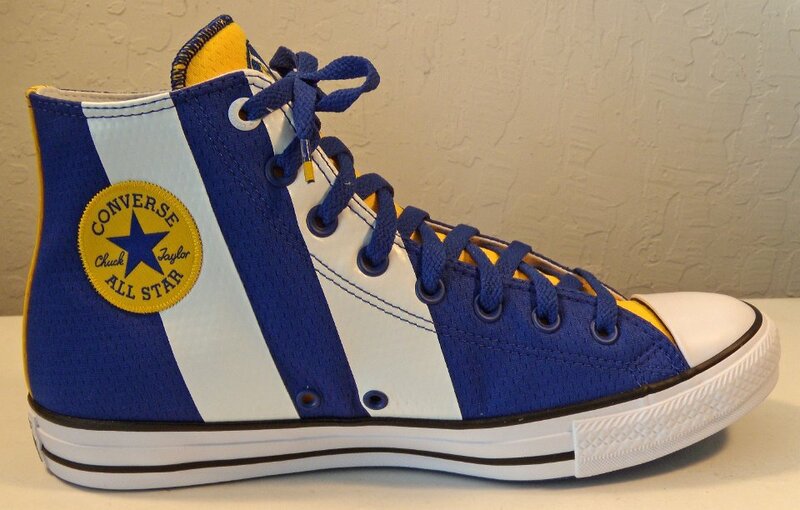 Golden State Warriors High Top Chuck Taylor sneakers are part of an NBA line of tribute basketball shoes released in 1917. 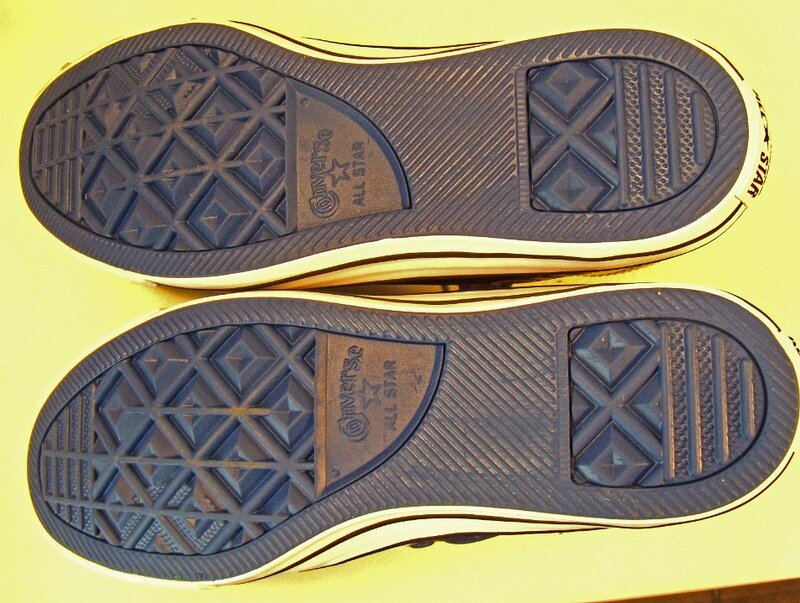 The uppers are made from a reiniforced canvas. 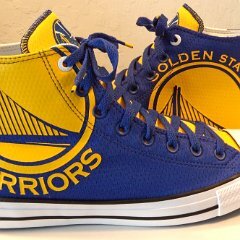 The shoes use the team blue and gold colors and the official Warriors team logo with the words Golden State and Warriors on opposite shoes. 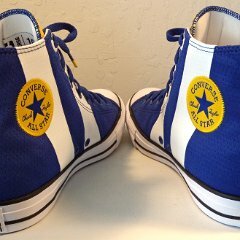 The design also includes white stripes on the inside patch sides that match the white foxing and top caps. 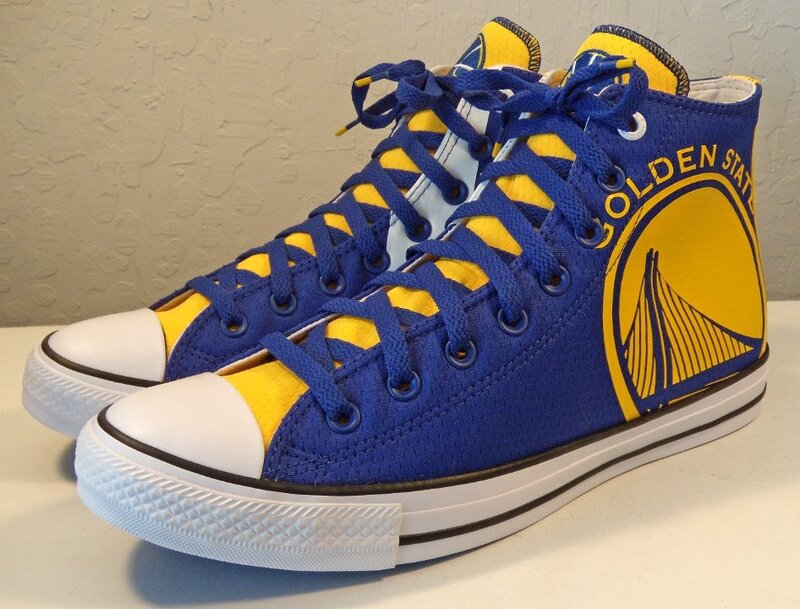 The sneakers have black racing stripes and an embossed black and white heel patch. 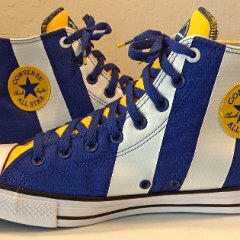 The tongues are yellow as are the back spines. 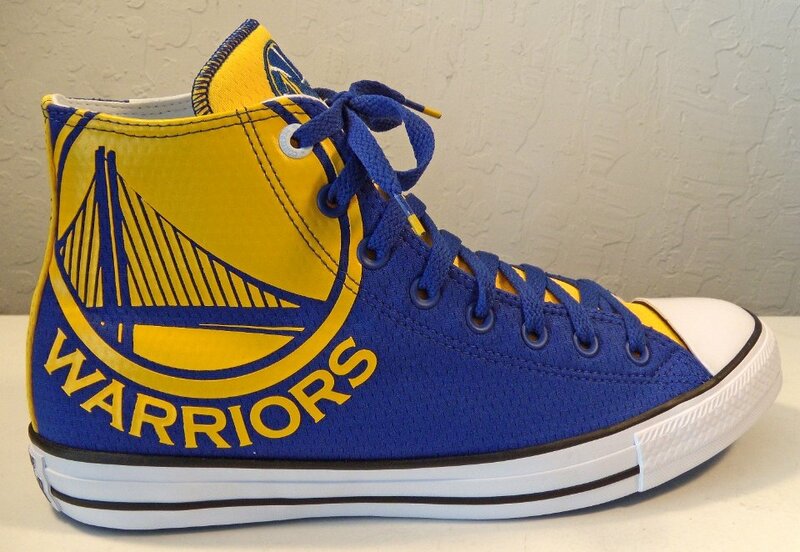 The shoelaces are blue. 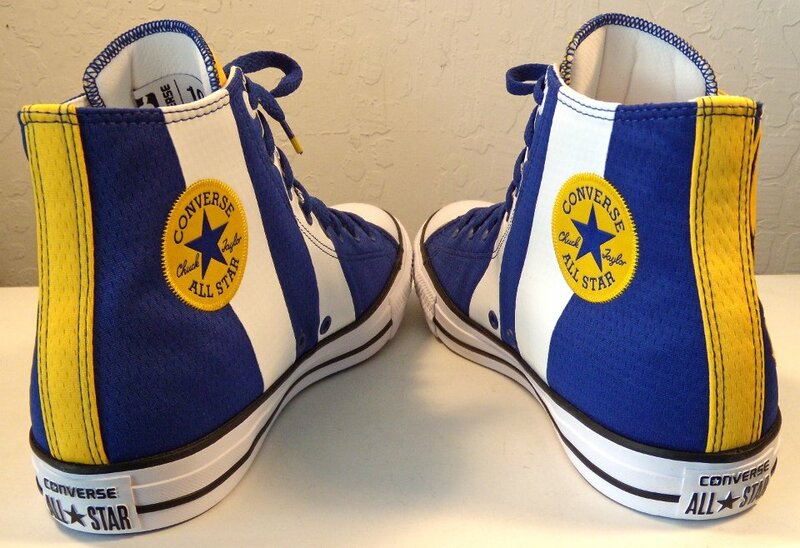 The thread on the shoes is blue as is the threading on the edges of the tongues. 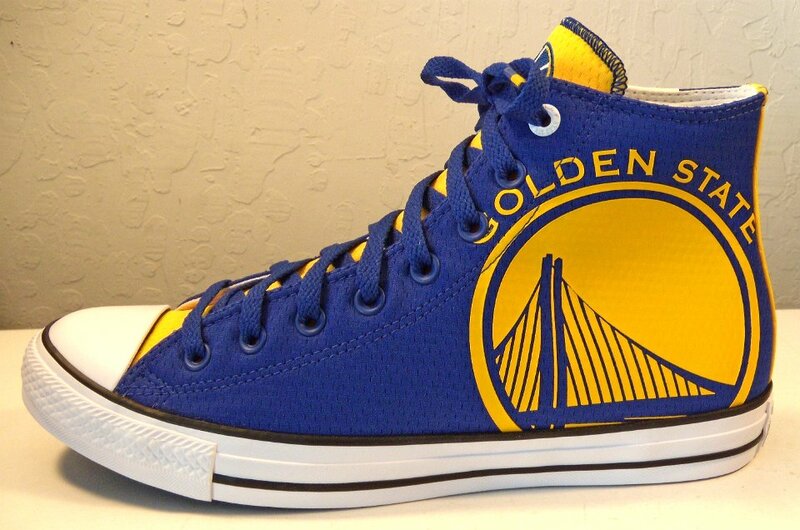 There is a Golden State logo at the top of each tongue. 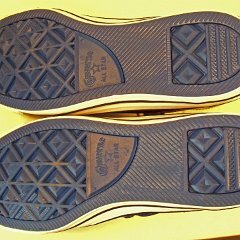 The outer soles are blue (all the blue colors on these sneakers match). 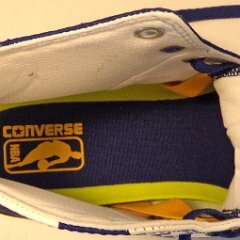 Inside each sneaker is a blue and neon yellow Lularlon insole with the words Converse in yellow and the NBA logo on it. 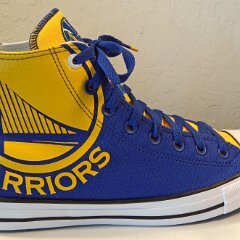 There are also stretcable supports that hold the tongues in place. 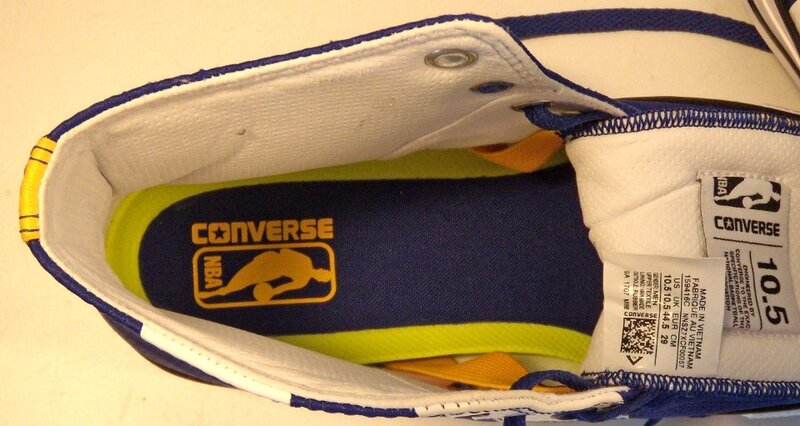 Inside the tongue of the left shoe is an extra patch with the shoe size and Converse and NBA logos.